TAMPA, Fla. -- University of South Florida geoscientist Brian Andres, Ph.D. has named two new species of pterosaurs from his home state of Texas in the journal Earth and Environmental Science Transactions of the Royal Society of Edinburgh, published online last fall. The volume was in honor of Wann Langston Jr., an American paleontologist who was considered the father of Texas pterosaurology and was professor at the University of Texas at Austin from 1963 to his retirement in 1986. Langston, who died on April 7, 2013, first interested and then inspired Andres in pterosaurs as a freshman at UT. One of the new species, Radiodactylus langstoni, also was named after Langston. It is a smaller and more primitive relative of his Quetzalcoatlus, the largest known flying organism, with a wingspan of more than 32 feet. 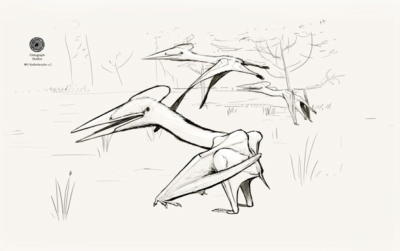 In his article titled Lone Star Pterosaurs, Andres and his coauthor Tim Myers from Southern Methodist University, named the new species and presented the largest evolutionary analysis of pterosaurs to determine where Texas pterosaurs fit in the "Tree of Life," a metaphor used to describe relationships between organisms, both living and extinct. "The state of Texas has one of the greatest records of pterosaurs in the world, surpassing all other U.S. states and most countries in the number of occurrences," Andres said. "Uniquely, this record extends over the entire 150-plus million history of the pterosauria." "Review of the record confirms at least 30 pterosaurs known from 13 occurrences, including five valid species," he said. "The holotypes of two of these species have been described before and are diagnosed and erected here as the new species Radiodactylus langstoni and Alamodactylus byrdi." Andres is a visiting assistant professor in the School of Geosciences in the College of Arts and Sciences at USF. He is the first vertebrate paleontologist at USF and the world's expert in pterosaur evolutionary relationships. He received undergraduate degrees in biology and geology at The University of Texas at Austin, a master’s in biology at George Washington University, and master’s and Ph.D. degrees at Yale University.